From Doctor Who to Robert Altman’s Vincent and Theo, from Akira Kurosawa’s Dreams to last year’s animated Loving Vincent, and the exhibitions constantly touring the world, Vincent van Gogh is never far from the public imagination. The same could be said for Willem Dafoe, who has worked in film, TV, theater, animation voice-over, video games, and dance for over 40 years, and in 2019, celebrates his fourth Oscar nomination for playing the Dutch painter in At Eternity’s Gate. Dafoe’s been the subject of more than a couple of memes, and even played Jesus (in Martin Scorsese’s The Last Temptation of Christ). Last year, in addition to playing Van Gogh, he made his DC universe debut as Atlantean Nuidis Vulko in Aquaman beside Jason Momoa and Nicole Kidman. That is to say, his Best Actor nomination seems long overdue. 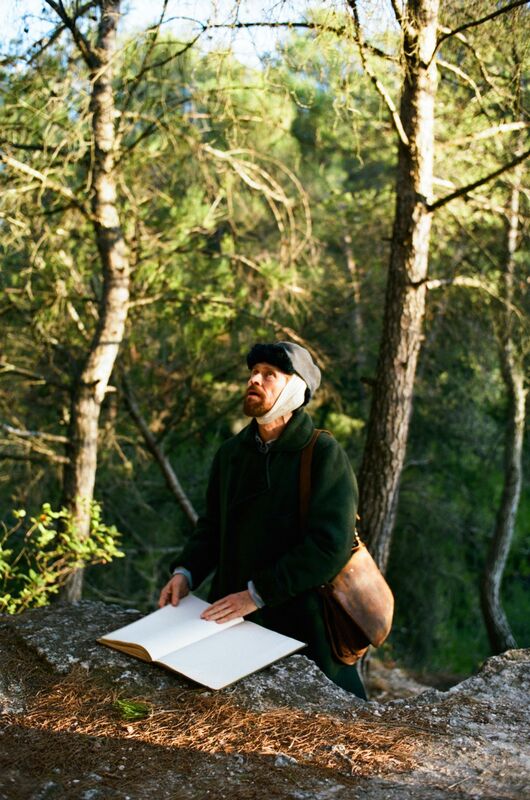 Director Julian Schnabel’s film plays like a dream, using camera work that dives into the painter’s point of view, as well as shifts and shakes when things become dire, to simulate Van Gogh’s final days. Rather than hammering home the well-documented history of his troubled art career or the whole ear thing, Schnabel affords us the opportunity to actually watch Van Gogh live and create. 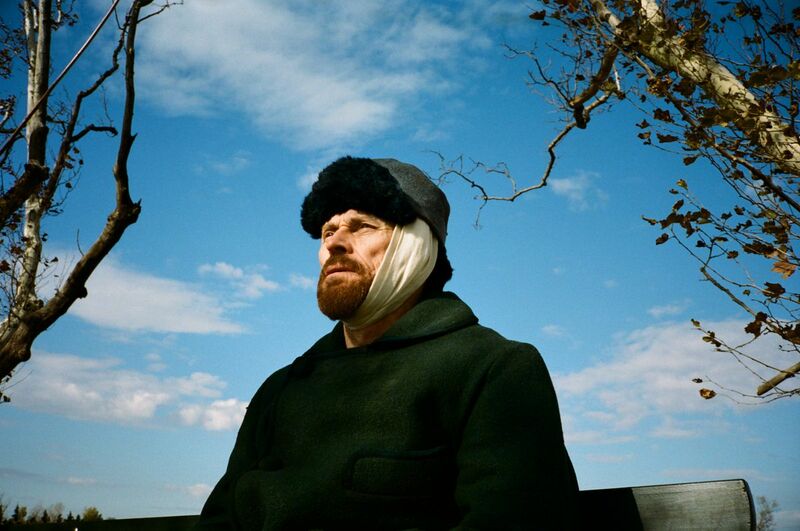 To prep for At Eternity’s Gate, Dafoe not only to learned how to paint, but paint like Van Gogh. With the film out now on digital and VOD, and with the Oscars just over a week away, Dafoe spoke to Polygon about how learning to paint changed the way he views art, his favorite moments in movies, and his “glorious defect” in how he approaches his work. 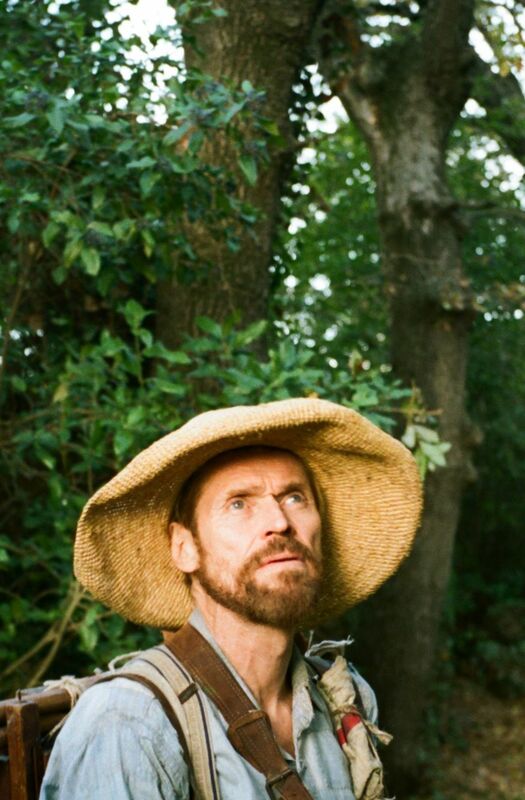 Dafoe as Van Gogh, after the whole ear thing. Polygon: Is there a particular quality in paintings or art in general that you gravitate toward? Willem Dafoe: I’m not sure I’ll be able to explain this, but I like it very much when I can look at something and I want to eat it. [laughs] That’s one quality, and the other quality is when I look at something, and I kind of see the origin of it, and I see its singularity, that it doesn’t remind me of anything. It doesn’t point to anything, it just is, undeniably, and it draws me in just by its sheer beauty or its sheer singularity. I think that’s what I like. Speaking of finding that point of origin, did that desire play into the way you actually painted in the film? Learning how to paint for the film changed very much how I view painting. I’ve known Julian for 30 years and I’ve hung out with him in his studio while he’s working. He’s painted portraits of me, so I was familiar with many things about how he approaches making something. When I learned how to paint, it really changed how I see things. I remember he taught me many things about the idea of making marks and the relationship between colors next to each other; how they could be autonomous or they could go somewhere together. When I would try to paint something, sometimes he’d kind of hold me back because I was always in a rush to complete it. He’d say, “Look, what do you see?” And he’d show me the dark sections, the light sections; he’d indicate certain areas of color. He started to make me see things more in terms of color and light and shape, really. It’s not quite deconstruction, but what that does is it makes you shift how you see things — not just painting, but how you see everything. When we talk about origins, if you can see what something is made up of, rather than just accepting its function or its place — if you can see where it comes from — it opens up a new way of looking at everything and, fundamentally, what the rise and fall of anything is. I think that’s something that, in his writing and in his painting, Van Gogh does best. Was it at all nerve-wracking knowing that you’d be seen painting these works? Yes. That was the pleasure, and that was the key to the whole performance for me. But it was nerve-wracking, because I didn’t want to disappoint Julian. He couldn’t do it. There was no stunt painter; he could only teach me to do it, and I had to be his creature. I had to be him, in the story. I had to be his Van Gogh. Now, I loved being in that position, but because I am not as trained a painter as him, I don’t have the same honed instincts or the technique or any of those things, but what I do have, is — I had a willingness to learn and consider things. He was a beautiful, generous teacher, and it was not so much about the actual techniques, it was about ways of seeing and approaching what I was doing. He was very generous with me, and really changed my way of seeing things. He approached the whole project of teaching me how to paint with generosity. You’ve known Julian for such a long time, and you trust each other as collaborators, but do you remember the first time you guys met? I’ve been trying to think about that. I don’t remember specifically, I really don’t. I think it may have been a very brief meeting at a nightclub, once. Not that either of us necessarily hung out at nightclubs, but I think it happened at a nightclub. That was probably in ’86, because I remember he was referencing Platoon, if I recall properly. But I’ve known him for years. We’ve known each other lots of different ways, and I’ve played small roles in some of his movies. We’re New Yorkers. So what was the initial conversation between you and Julian about this film? When I first talked to him, I knew he was thinking about it, but he wasn’t sure he was going to make the movie. But he did want to explore it, he did start writing. He told me to look at that [Steven] Naifeh and [Gregory White] Smith book, The Life, and he told me to make notes — just pick out anything that interested me or quotes that I liked from the letters — and I made quite a few notes, and I had a good time reading that book. Then I sent those notes off to him, and they incorporated some of it in the script. Then I slowly became more involved, and felt like a collaborator on the project. Keep in mind that I’m giving him those notes as a friend. I’m not doing it because he told me I’m going to play Vincent van Gogh, because he’s not even sure he’s going to make the movie at that point. Then he gets the scripts — that of course changes — but a good, strong script, and he tells me to come over to his house and just wants to play around with some things. So he put a terrible fake beard on me, because I was clean-shaven at the time, and puts some fabric on me, gets me in a good light, and starts to take pictures. I think it was after that little photo session that he felt confident that I was the guy to play the role. The Naifeh and Smith book is something I was curious about, because their theory that Van Gogh didn’t shoot himself is a controversial one. Why did the film go in that direction? That was Julian’s choice, but I’m fine with it, I like it. He saw it as a possibility, and he thought it was a more interesting possibility than the other. We could argue the evidence for or against it, but the truth is, on some level, all I cared about— the guy died an unnatural death, and how he died was not so important to me. That’s not really what this movie’s about, and if you get too crazy about that, it turns you into, you know, movie of the week. You mentioned you didn’t know much about Van Gogh’s life prior to working on the film. Did you have much of a relationship with his artwork? Of course I knew it, but I didn’t know it exhaustively. When I was very young, I spent a great deal of time in Amsterdam — I mean, when I was young man, because I was performing at a theater in Amsterdam quite a few times. While he painted so much in France, primarily in France, of course, the Van Gogh Museum is in Amsterdam, so I saw a lot of his work there, and in other travels, I’ve seen his work. I always appreciated it, but I didn’t have the way of looking at it that I do [now]. I think this film is the first time I’ve seen Vincent and his brother Theo’s relationship portrayed so tenderly. Did you talk it over at all with Rupert Friend? No, we didn’t really have any discussion. I didn’t discuss everything with Julian, either. We mostly just did, but Rupert was very loving, and very sweet, and I respond to that. [laughs] The setup is so beautiful, particularly the scene where he visits him in the asylum. The setup of that is tender. I think I’m most moved in movies when people are kind to each other, not when heroic moments happen or great victories are made. The thing that always moves me is when people are just sweet to each other in an open-hearted way. That was so clearly there in the scene that we didn’t have to discuss it, we didn’t have to play it there. We just sort of lived it in giving over to the pretending in that scene. You’ve spoken in previous interviews about not wanting people to know too much about what you think, which I imagine must be a tough line to tread in discussing a film as visceral as this. Right. There’s such a mask, then, because it’s such another time. It’s subject to people’s impressions of — well, in this movie, I don’t worry about that. When I speak about that, not wanting people to know too much, I think that was in reference more to my personal life, or maybe I was talking about when I’m performing. Some actors are — well, I shouldn’t say this, but — some actors are very proud to be transparent in their thinking, and then what happens, I find, is sometimes you can indicate thinking in a way that’s more showing than doing, and I’m more from the doing school. I have a dialogue into doing, where I’m basically disappearing. There is a dialogue, but it’s a dialogue that’s filled not with answers, but with questions, and when people are watching it, if they’re really with the character, if they’re really with me, they’re with those questions, too. Those questions open you up, more so than answers or observations that we can recognize and relate to, and we have an emotional response to. In performing, I love it much more when the audience has to come to the action that’s happening and be with the actor. This film is a perfect example of that. You’re really with the character. He’s not telling you what he’s feeling; he’s doing things. How it’s shot, how the camera is, the pace of it — it allows you to be with him. That’s a great gift that Julian has created, in this way. I understand you keep a daily diary. I’m curious as to when and why you got into the habit. Just so I could become more articulate, and I could practice organizing my thoughts. I think that was it, because my writing is so illegible that I can barely read them. So it’s an exercise of focus and articulation. And probably review. There’s a certain amount of reflection, because what I write down, usually, is quite like a little kid writing in their diary. I talk about what happened in the day, I may talk about a news story or someone that — various little details. You just realize it’s a way of pinning down what’s floating around in my head, and kind of exorcising, getting it out of my head by putting it down on the paper. Calling it a day, I think. Letting it go. It’s an exercise of letting it go, because once you make something, if you don’t decide to hang onto it, you can really let it go. You’re now part of two superhero franchises as well as an anime/manga adaptation. Are you much of a comics person yourself? Not really. I appreciate them, but it’s not part of my daily diet. 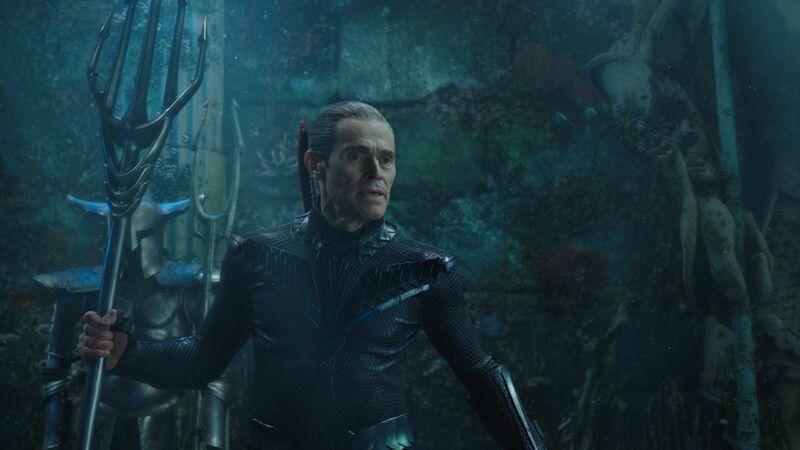 Dafoe as Vulko in Aquaman. What is part of your daily diet? I love to watch dance, and I love to go to galleries. And I love movies. Speaking to that first point, you started out in experimental theater; is that something you find to be in conversation with your film work? I’ve never stopped being in the theater. I mean, I perform less because I’ve been busy with movies, but as recent as last December, I did a theater piece in Italy with Romeo Castellucci. Is that something you’d do more of if you had the time for it? If I was another person, yes, I would. I love performing in the theater. I like the ritual of it, and I like the physicality of it. And the fact, obviously, that there’s also an athleticism, because you get to perform one thing from the beginning to end. There isn’t the same kind of interruption. It allows you, every night, to have a rhythm take over. You’re much more in control of your rhythms, where in a film, yes, you can have rhythms within a scene, but you don’t have the same kind of mysterious arc that happens in a theater performance, for example. Part of the joy of being in theater is what some people find really not interesting. I love the fact that you reanimate something. I love being reckless or being free inside of a structure, and certainly theater, no matter what kind it is, has that element to it. In film, you’re often making the structure as you’re shooting, along with the performance, so you’re not revisiting things, you don’t get much practice. Yes, you get multiple takes and that sort of thing, but you don’t get much practice revisiting something that’s already then made, and rebuilding it — which brings us back to Van Gogh, who kept on painting the same things over again. That’s one of the fascinating things about looking at collections of his artwork, is that he kept returning to the same subjects. Not just the same subjects, sometimes he’d repaint the same painting. I assume you had to do a lot of that in your preparation. Yes, because I had to practice. To paint those shoes — I knew I was going to paint them in real time, and while Julian could coach me while we were shooting, still, as much as possible, I wanted to be autonomous, and know some of the architecture, have strategies or ideas about colors, things like that. I painted those shoes many times, because I knew I had to paint them uninterrupted. [laughs] Don’t make me do that! By the time that you were done with the film, had you painted anything that you looked at and wanted to eat? Absolutely! Yeah, but much more Julian’s paintings than mine. Did you keep anything that you’d worked on? I kept a couple of early things that I worked on, and Julian gave me a couple of things that he painted. Some portraits. You’ve also spoken about wanting to keep things moving, keep doing new things; is that an ethos that becomes harder to abide by, the more work you do? Not really. I maybe have a glorious defect in me, but when I’m doing something, sometimes I feel like I haven’t done it before. Recently, I’ve been involved in some movies that don’t remind me of anything, except for them. There’s no strain to do different things; it happens kind of organically. I’ve made some very different movies with very different situations, and I think that only happens because I don’t seek it specifically, but I’m open to it. It just happens. Maybe down the line, it would be difficult, but right now it’s decided by what has always decided what I do, and that’s a combination of things. It’s conditioned by what I feel I need, and that’s always changing. I never quite worry about getting stuck until the opportunities stop, and then if the opportunities stop, then I’ll make some adjustments. Or I won’t. So is there anything that you feel you need right now? Need is a funny word, you know? The only thing I need is to wake up and feel engaged. That’s what I look for. I look for opportunities where I can be changed, and I can still be alive and in a state of wonder, really. Performing is so much about the quality of being there, and I look for those opportunities to be there. It sounds simple, but it’s the hardest thing in the world to do.